Photographer John Miller has spent his life documenting protests with his camera. Part of a rich tradition of documentary photography which, in the twentieth century, has captured some momentous events and moments in the struggle for peace, Miller has been an observer of anti-war protest since he began taking photographs, as a secondary school student, of demonstrations against the Vietnam War in 1967. Attending Victoria University in 1969-70, and working as a CRACCUM student newspaper photographer in 1971-72, Miller became focused on the various protest movements that were taking place at the time. Not exclusively concerned with peace or anti-war protest, Miller and his camera were at the scene of civil rights events and the generation of Mäori who began standing against racism and injustice in Aotearoa. Photographs of anti-Vietnam War demonstrations sit alongside images of protests against sporting tours of South Africa, and the activities of Nga Tamatoa or the famous Land March of 1975. Miller’s documentary work reveals the connections between peace and equality, that peace will not come without freedom for all members of society. Miller writes, ‘Considering the various manifestations of civilian dissent in regard to particular government policies (whether New Zealand, South African or American) that I have photographed, I seem to have been performing the role of a sympathetic observer, insofar as I tend to support the causes that motivate such protests, rallies or meetings’. His photographs are witness to the many individuals who have stood up for peace and freedom, and they carry this message to the wider society, challenging the status quo and the structures of power that perpetuate the conditions in which war is a legitimate activity. As Miller notes, ‘All in all, civil dissent against the military (and, more recently, the economic) policies of the United States is the enduring constant of much of what I have photographed over the years. If anything has changed, it is the realisation that many of the seemingly disparate issues protested against are actually interlocked. For instance, that the US is using its US$390 billion per annum military machine to back up its economic global reach through the World Trade Organisation and various bilateral and multilateral trade and investment treaties; to sequester the world’s oil supply; to seize control of, and genetically manipulate, global food production; and to ignore the harsh reality that the planet’s survival really does depend on the U.S. drastically curbing its hugely disproportionate consumption of the world’s resources’. In 2003 Miller received a Media Peace Prize Lifetime Award in recognition of his photography, and its role in helping to promote the cause of peace. 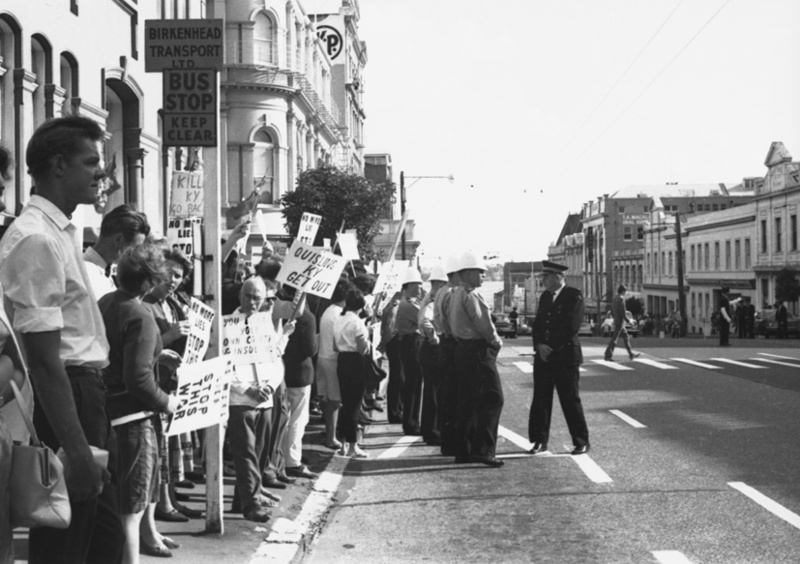 Aroha Harris, Hikoi: Forty Years of Maori Protest. Wellington: Huia Publishing, 2007.